We have had Gracie for almost two weeks now and I have learned a few "Puppy Essentials". 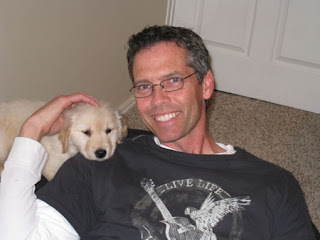 As always I should add the disclaimer that I am NOT an expert in the field of animal behavior. If you are looking for expert advice you can check out Pup Parenting by Lynn Lott, Jane Nelsen and Animal Behaviorist Therry Jay. I have spoke to enough dog owners and met enough dogs to know that crate training is a good thing. But I wasn't sure exactly how to go about it. So I consulted the internet and found a great article on the Humane Society website. The first thing I learned was that the crate should not be a place of isolation or punishment. 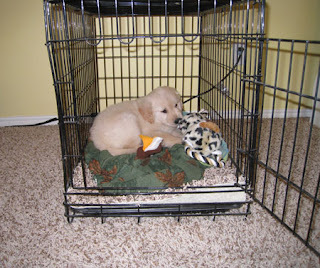 The idea is to get your puppy to think of the crate as a safe and comfortable place. They recommend putting the crate near you during the day so your puppy can go in and out on their own. At night the crate should be in your room or nearby. (I put the crate in the room across the hall from my room) At bedtime I just put a training treat in the crate, close the door and lay down beside the crate. In 2 or 3 minutes Gracie is asleep and I can go into my own bed. The hardest part of having a puppy is that they need to go to the bathroom several times at night. For the past two weeks I haven't been able to sleep for much more than 2 or 3 hour at a time. But eventually she will be able to go longer between potty breaks. This morning she slept from 2:30 a.m. to 7:30 a.m.!!! Five straight hours of slumber! It was pure bliss! We went to Costco and bought a box full of puppy toys. I have toys scattered all over the house so I can re-direct Gracie's attention from chewing on inappropriate things (like the furniture, my daughter's feet and the house plants) and get her to chew on one of the toys. I have also had to teach my children to put their possessions out of reach and close their bedroom doors. 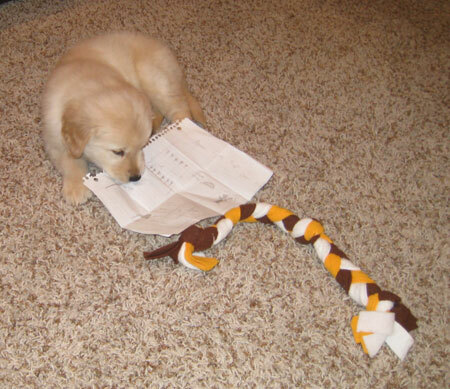 Sometimes they forget and Gracie will quickly remind them that she will chew on almost everything in sight. 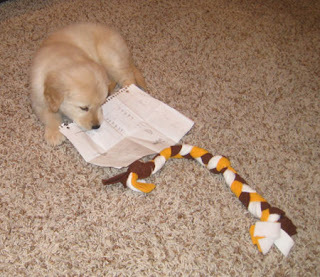 On the bright side, my kids can finally use that age old excuse "My dog ate my homework!". Gracie has become my little travel companion. Right from the start she has loved the car. 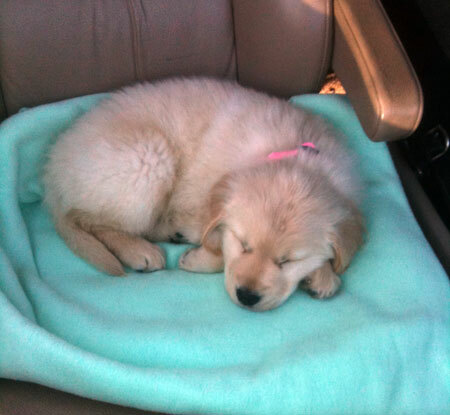 She curls up in the front seat and goes to sleep every time. And when I need to stop and get out of the car, she patiently waits in the front seat for me to return. I am so grateful that she likes the car because Dad's Taxi is still in business and she is going to be joining me on all my trips to school, sports practices and music lessons. Gracie and I bonded as soon as we brought her home. Sometimes she will whine when I leave the room. Fortunately I got a good pair of slippers for Christmas that I wear around the house. When I'm not around Gracie will often find my slippers and snuggle up with them to go to sleep. 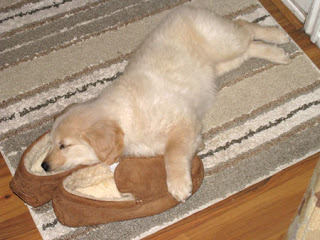 Even though she will chew on anything from my sprinklers to our wood furniture, she has never chewed on those slippers. 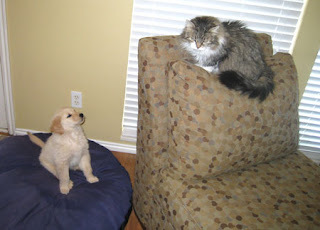 The one member of our family NOT excited about the new puppy is our cat. She was downright angry the first time we brought Gracie home...now she is just annoyed. Fortunately she has several safe perches where she can relax while she plots her revenge. Too cute. We are bringing home our puppy in March and already have a very SPOILED cat at home. I am not looking forward to the cold shoulder I will be getting but it's nice to now that they might get over it!